Answer: 50 years ago, or in this case 45 years ago. I stopped by yesterday to see my sister who lives in the house where we all grew up and talked to our neighbor who has been next door for 45 years. This picture is in his back yard. 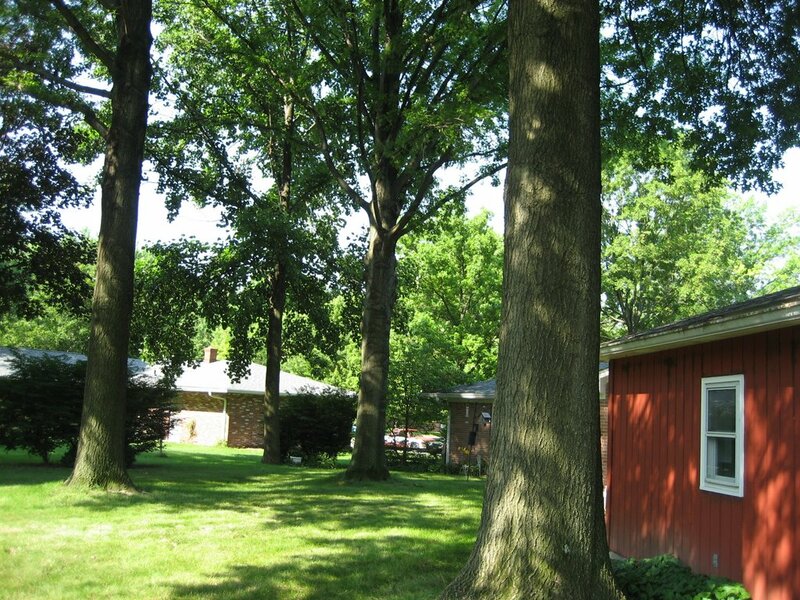 He said what amazes him is that he planted these three large oak trees himself. In 1961, he dug the trees out of a fence row (where he knew the owner!) along with three other oak trees that he said fortunately did not make it. He also planted a tulip tree some time ago; it's the smaller of the trees in the background. 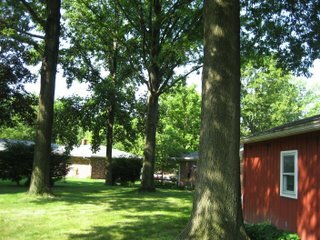 The way he has "limbed up" the trees over time provides a nice high canopy, and as a result, they have a pleasantly shaded but not heavily wooded back yard. I just found your blog. I like it, the backyard here looks so peaceful! I read once that a person plants trees for future generations...it is true that one of the most unselfish things we do is to plant trees...especially oaks, considering how long it takes them. whenever i come across an old tree that was clearly planted, i give thanks to someone i never met. fantastic post. barrie.